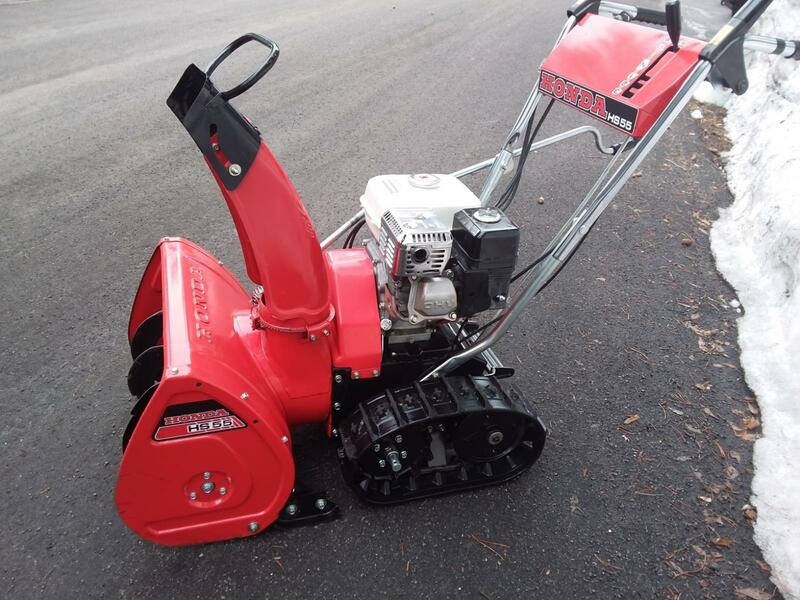 Snowblower Forum : Snow Blower Forums > Snowblower Brand Forums > Honda Snowblowers > HS55 smokes on startup. Hi everyone, new poster here but have read these helpful forums many times for advice. I am a fairly experienced small engine mechanic in the home/diy sense and I own over 20 pieces of small engine powered equipment at home and at my farm that I keep running and rarely farm out any work. First the background. This past fall, I acquired a new-to-me Honda HS55 from an estate sale. It must have been the original owner because they had all paperwork and bill of sale from the dealer back in 1986. The HS55 smokes like a cheap cigar on startup and for 1-3 minutes while she's warming up. I believe this is oil smoke as it's white/gray in color and smells "oil". But once the engine is given time to warm up, the smoking stops. Usually running it at a fast idle for 1-2 minutes is enough. Then it doesn't smoke any more regardless of throttle setting or use. It's always on cold startup that the smoking occurs, stop her and start her again within an hour and there is no smoke. Therefore, I do not believe this is a case of worn rings or valve guides because why would the smoke stop? Also, the amount of use this machine has had would not be indicative of the hours needed to wear out rings/guides on this type of engine. But, of course, I could be wrong. The spark plug has been replaced, but it looked fine with no signs of excessive oil consumption. I also replaced the muffler on the theory that somehow oil got backed up into the muffler and is burning off when cold. I admit this was a wacky longshot and it did nothing to help. I am running fresh, non ox fuel with no additives. The machine starts and runs perfectly, one pull fires her up, turn choke off, and she runs like a champ. Machine has compression that you can feel in the pull cord, but I don't have a tester so I can't give exact PSI. Does anyone have any insight into what this could be? Could there be some kind of oil return passage that's blocked and causing oil to seep into the cylinder and then be burned off on cold startup? The first thing I would check is oil level. if on a level surface you remove oil filler cap and oil comes out then it is overfilled. 2nd. check oil breather tub coming out of valve cover for clogging. otherwise do you think once it's warmed up rings and valve guides expand? maybe a Honda mechanic will chime in soon. this machine was built in 1984-85.
otherwise do you think once it's warmed up rings and valve guides expand? It's not overfilled unless Honda's are supposed to be run with the oil "down on the dipstick", say for example no fuller than half way up the stick. There is no "full" line on the dipstick, so to me that indicates anywhere above "low" indicator is acceptable. But yes, I'm running it at the top of the full zone as indicated on the dipstick. Maybe this is incorrect for a Honda? Honda experts, should I lower the oil level to about half way? I've never seen an engine that had rings or guides so worn that it would go from smoking THIS badly to not smoking at all after warmup. Sure there's expansion no doubt, but I've never seen an engine that could tighten up this much such that the smoke stops totally after warmup. Again, maybe this is typical for a Honda? Forgot to mention, I have checked the breather tube and you are right, this was Suspect #1. But I'll go out and check it again just to be sure. since this motor takes less than a quart of oil I would keep it near the top. what I was thinking was excess crankcase pressure. but I guess if that were the case it would continue smoking? since it is smoking on start up and for a couple minutes what does this suggest? oil leaking into combustion chamber after a long shutdown? hopefully someone will come along with an idea. I have had older Honda's do the same thing but really didnt care. just kept an eye on oil level. An engine rebuild would cost more than the value of the machine. I bought mine for $300. It does not smoke but had an old HS 50 that i got for free and it smoked at start up and then stopped. I gave it to a neighbor that has used it the last 2 winters with no problem. The cylinder walls may be glazed and in need of honing to get some crosshatching back in place, followed by a dose of dino oil to get everything properly acquainted. I've seen a few Honda Lawnmowers (and I've heard of many more) that smoke at startup and then the smoking stops when the engine is warm. I have one that has done this for 5-yrs now. I think that oil leaks past the piston rings while the machine sits between uses. I tried a suggestion from a lawnmower forum which was to store the machine between uses with the front wheels raised 6" because oil won't travel uphill past the rings and into the combustion chamber like it did when the mower was stored level on all 4-wheels. This method worked pretty well and the machine only smokes now for a few seconds, instead of 1-2 minutes like it used to. I don't know if this is easy to do with an HS55, but if it is I suggest you try it. You could have worn valve guides, and also using thin light weight oil like 5w30 will cause them to smoke until they warm up and clearances expand causing a better seal. If it is just from the thin light weight oil, I wouldn't worry about that too much, that is normal. The HS55 is an older model, it may have some wear in the cylinder, rings sticking a little, or worn valve stems and guides. If its the thin oil causing it, I would switch over to Amsoil synthetic 10w30 power equipment oil. That oil will flow at minus 45 degrees Fahrenheit and wont smoke nearly as much as other synthetic or standard oils, plus oil consumption will be less. I just dealt with that on a mower. 30 year old GXV140 . . . tore it down, and ring and gap was just .022 . . . same rings on the unworn cylinder area read .012, so (doing the math) less than .001 cylinder wear. What I did find is that all 3 rings had rotated to be in line at the bottom, causing a decent initial puff, and a bit of hazing thereafter. That, and on these older engines, Honda used a one piece oil ring that didn't really work well. A light honing and a new ring set (now with a 3 piece oil ring) and now zero smoke at any time . . . no detectable slop in any valve guides, but I did find that Honda had added an intake valve stem seal to later serials, and which I retrofitted into mine as well (no mechanical changes to the head - just needed to put it in on reassembly). Conclusion: depending on the engine and wear, this could be pretty simple . . . Thanks for all the replies on this guys. I'm using 10W30 Mobil 1, so not 5W, but what would you think about going to 10W30 semi synth or conventional to thicken things up a little at startup?